Can I get sidetracked for a second and say that I would love to have that coat now, I was a fashionable little kid! So you are probably saying what does your foul mood have to do with a pecan rhubarb crumble? Well hold your horses and I’ll tell you. Like with everything in life my brain cloud began to lift, the sun made an appearance for a bit and I made dinners and enjoyed every last bite. I was no longer a sour puss to be around, I guess. My good mood just took a little vacation but it’s back now. Though a younger me did not have to kick me in the behind I was rather filled with some guilt at the pill I must have been for my husband. So I made something all for him. Every so often he mentions rhubarb when asked what he would like for dessert and because I really don’t care for it I usually don’t go with his suggestion. Bad wife. I made amends with a Pecan Rhubarb Crumble and good news is he enjoyed it and I even had a bit and thought for rhubarb it wasn’t to shabby. I was even told that I was not a pain to be around so yay! All is better. 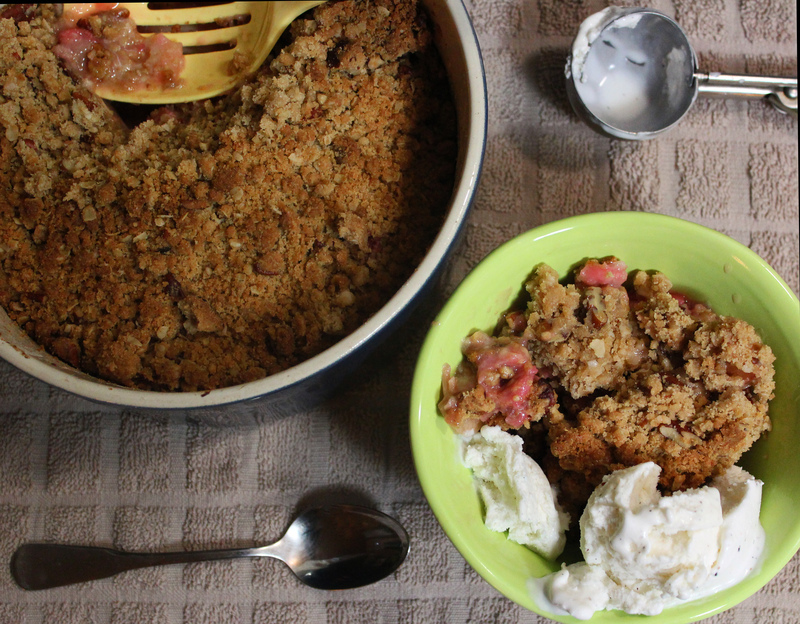 If you are suffering from a brain cloud week may I suggest making a pecan rhubarb crumble and then hiding under the covers if you feel it is still necessary. Enjoy! mix crumble ingredients and squeeze together to form large crumbs and place in freezer while preparing rest of dessert. Combine the rhubarb base ingredients in an 8×8 pan (I used a ceramic souffle type baking dish) scatter crumb topping on top. Bake in a 375 degree oven until golden. about 45 minutes. Serve with vanilla ice cream if you like. Enjoy! What an adorable outfit! And the crumble looks mighty good too. My grandmother used to make a lot of our clothes. I’m not sure if this was one of hers but I would sport this around town now if I could!